Season the beef as desired. Cook the beef and onion in a 12-inch skillet over medium-high heat until well browned, stirring often to separate meat. Pour off any fat. Stir in the Italian seasoning. 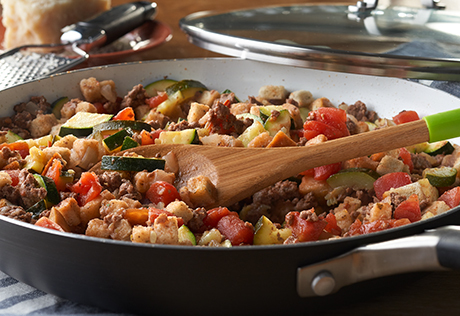 Stir the zucchini and tomatoes in the skillet and heat to a boil. Reduce the heat to low. Cover and cook for 5 minutes or until the zucchini is tender. Remove the skillet from the heat. Add the stuffing and cheese to the skillet and mix lightly. Cover and let stand for 5 minutes. Season to taste. Serve with additional cheese, if desired.